My house has been decked for weeks with lights, pumpkins, and every kind of dead person you can imagine. We’re on pins and needles waiting for the day we can dress up, eat half our weight in candy, and see how badly we can scare said candy out of each other. That’s fun and all, but I truly respect how other cultures still have meaningful reasons behind their similar holidays. El Día de los Muertos, or The Day of the Dead, is a beautiful tradition that I’d love to celebrate. 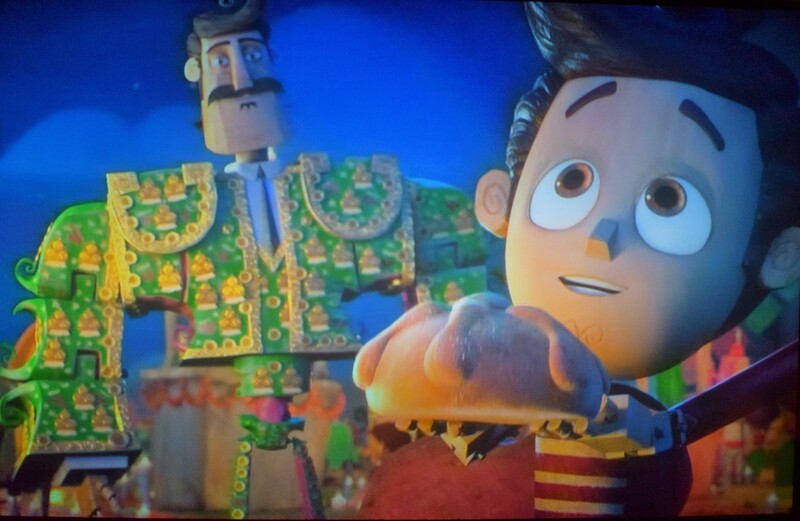 The Book of Life puts such a fun spin on the holiday with the Land of the Remembered. With all the fiestas, parades, balloons, and food, I could get along just fine there. That place is really hopping and they have all you can eat churros! 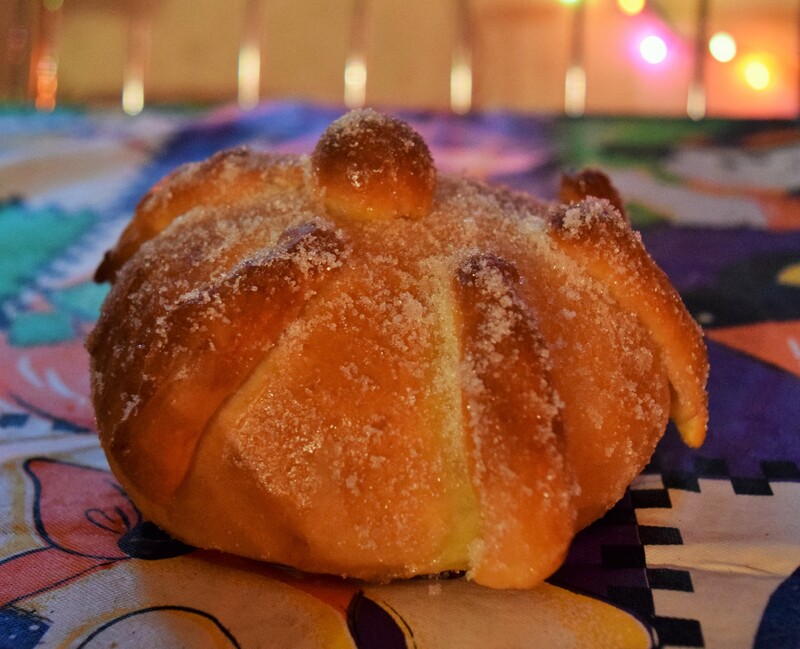 That’s delicious but I’m going to focus on the even yummier holiday staple, pan de muerto. There were piles of these wonderful little guys all over the cemetery and it makes me want to hop a plane to see this in real life. Even though La Muerte and Xibalba asked for bread as a way to gauge Manolo and Joaquín I’m pretty sure they just really wanted the bread. It’s that good. In a large bowl, dissolve yeast and 2 tablespoons of sugar in the warm milk. Let rest for 5 minutes or until foamy. Add the remaining sugar, salt, melted butter, eggs, orange blossom water, and orange zest and mix until just combined. Add flour and mix until everything is combined and dough pulls away from the sides of the bowl. Turn out dough on a lightly floured surface and knead until elastic and smooth, 10 minutes. Form dough into a ball, lightly oil, and place in a large bowl. Cover and let rest in a warm area until doubled in size, 1 ½ to 2 hours. Punch down dough and divide into 5 equal portions. Pinch off ¼ of each portion to use for decorations. Shape a large dough piece into a slightly flattened ball. Break down the decorative dough piece into 7 equal portions. Shape one into a ball, slightly flatten, and place directly on top of the large piece. Roll out the other pieces between your hands to form long strips. Pinch the ends of each strip, so they resemble bones. Place a “bone” on the large dough piece, so the top is below the ball and it extends to the bottom of the piece. Working clockwise, attach the other 5 bones in the same manner. Repeat this with the other sections of dough. Cover breads and let rest another hour or until they’ve doubled in size. Brush each bread with egg wash and bake for 25 minutes or until golden. Remove breads from the oven and move to a cooling rack. Once the breads are cool enough to handle, brush each bread with melted butter and sprinkle with sugar. All that’s left is to enjoy them! These breads come in a whole slew of sizes, flavors, and colors, but this is a good place to get started. (Seriously, this was my first time making them.) The Book of Life shows the importance of honoring and remembering your loved ones, so you can lead the best life you can from their examples. The decorations and food may be extra, but that doesn’t mean you shouldn’t go all out and have fun.